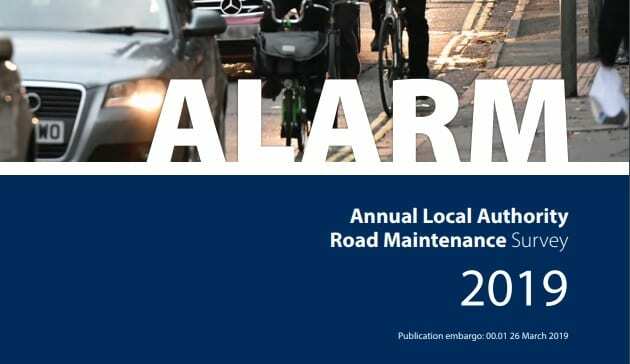 The 2019 Annual Local Authority Road Maintenance (ALARM) survey has been published today (26th March 2019). It reports that, overall, average highway maintenance budgets are up for the second successive year and there are some small signs that this is stemming further decline in local road conditions. Despite these glimmers of hope, the average annual carriageway budget shortfall in England and Wales is reported to be £3.9 million per authority, up from £3.3 million in 2018, and the amount needed to bring the local road network up to scratch is now approaching £10 billion. IHE President, Jonathan Pearson MSc CEng FIHE, commented, “The 2019 Alarm Survey results are cautiously welcomed. “Whilst on the face of it overall investment in the upkeep of our roads appears to be on the up, it is clear that underlying, longer term financing issues remain. A sustainable solution for future highway maintenance funding is needed in order to allow Local Highway Authorities to better manage their networks. A move towards multiyear settlements, with less reliance on in year ‘handouts’ needs serious consideration. This, coupled with a flexible approach to allocations of Capital and Revenue expenditure (adopting single funding stream principles and a TotEx approach) would help support effective decision making by council’s but will also help with the prioritisation and choice and timing of appropriate repairs. Furthermore, there are still significant concerns around the condition of local roads and the associated levels of investment, which are stark in contrast to that of our major routes. “Heightened confidence in long term funding, will not only help drive forward innovation, including improved asset management approaches, but it will also encourage highway authorities to invest in the resources needed in the longer term. In particular, the continuation of support for apprenticeships, as well as the development of skills and competence within the sector, will help to deliver on these initiatives, and the IHE will continue to work with industry partners to support engineers working in the various highway maintenance specialisms”.